I'm saying it right here and now, and the OEMs might not like it. The standard OEM checklist in most light general aviation aircraft is a longwinded action-dulling repetitive piece of detritus. It is also often the only FAA-approved checklist for the aircraft. These unwieldy booklets and lists breed contempt among pilots, who are often found skipping repetitive items or generic procedures that no longer apply to their aircraft because of customization or equipment differences. There was a time when aircraft didn't come with these elaborate booklets designed by the engineers and test pilots to cover the manufacturers from any possible liability. Before World War II aircraft checklists were simple enough to be a placard on the instrument panel or a mnemonic, CIGAR TIPS or GUMPS. The push to produce pilots that came with the ramp up and rapid entry into World War II, combined with the rapid increase in the complexity of the aircraft, demanded that visual checklists be generated to help the pilots get through the critical moments of flight. Designers understood that the checklists had to be visually verifiable, and created mechanical means for doing just that. Many classic airliners had scroll type or flip type checklists, where the co-pilot could flip a switch or scroll a knob as the captain completed each item he called out on the list. Even for general aviation the days of having a complete memorized normal operations checklist are long gone. Yes, you do still have to memorize “red box” items, such as engine fire procedures and emergency landing procedures. That said, if there is time to attempt an engine restart you'd better grab your checklist. And you won't pass even your private pilot checkride without brandishing the OEM checklist and demonstrating your slavish execution of its direction. It's in the Practical Test Standards, so examiners have to care. Here's why they do. NASA did its research in the 1990s and uncovered that otherwise excellent professional pilots have been seen to regularly “chunk” whole sections of checklists, glancing at the list, performing a series of tasks, and then perhaps glancing back to look over what they just did. Except a lot of times they never look back. They just “chunk” onto the next set of items. It might work some of the time, but skipping and chunking eventually leads to skipping something important, such as controls free and correct, or autopilot tested, fuel selector to fullest tank or flaps in position. These are the items that have killed pilots and passengers on general aviation aircraft and airliners alike. You can help yourself by doing what the airlines do: customize your checklist so that it perfectly matches your cockpit, and is doable. If that means digitize it on your iPad with one of the many excellent apps out there that allow you to actually touch-to-check each item, well, do it. You'll be using technology akin to that used in a Boeing 777, which allows pilots at a glance to see if they have missed an item, but is smart enough to know if they completed an item earlier in the flight and will show it as checked. If you have an integral MFD in the aircraft you fly there may already be a digital checklist programmed in. Take the time to learn how to customize and use it. Even a good paper checklist that is set up with a logical flow for your aircraft is better than an OEM booklet that forces you to skip items that aren't applicable or jump around to accommodate the logistics of your aircraft. Treat checklists as the safety tools that they are, and they can do their job. Just remember, they are proven to work when they make sense and they are used. So, make a sensible one for your aircraft, and use it. Sitting sipping my yerba matte tea I see the light rain washing the road dust off my vehicle in the parking lot outside this roadside hostel. The leaves of the maple outside my window rustle gently, but by looking up I can see that the trees on the hill above the road are swaying to much more than a gentle breeze. By my estimate it is blowing 20 knots or better at hilltop height, and probably much harder than that if you climb to the mountain top that frames this verdant valley. Oh, and it's cool, near 50°F here at 1500 MSL. I don't need the weather channel talking-head to tell me it's close to freezing level at the top of some of those 4,000 MSL mountains this morning. These are the days I am more than happy to sit out flying. Why? Simple. My airplane, a light, single-engine, piston-powered four-place machine, is not outfitted for this weather. Sure, I can fly it in the clouds if I want to—both the airplane and the pilots are qualified and equipped for flying on instruments (IFR). Ice, however, we don't do. The airplane is simply not equipped to deal with an inflight icing encounter. We've got pitot heat, and that's about it. Days like today, when a slow-moving occluded front is dumping more rain than anyone has seen in decades on the northeast, and a bubble of chilly artic air is pushing in over the top and behind this mess, well, aircraft equipped as ours is are best left tied down tight or tucked in hangars. The good news is that we planned for this. Anytime we take a long cross country excursion in our airplane we make sure to pad each stop along the way with potential bad weather days. We pick airports that won't box us in too much (that is, won't force us to wait for a perfectly sunny CAVU day for a safe exit); and we pick fuel stops and destinations where there are both fair weather and foul weather activities to keep us busy. That way we take all gotta-go and get-there-itis pressure off we pilots. The result of this wise planning is that I've discovered wifi in the tininest libraries, in the tiniest towns in the USA. Cosy coffee shops are my friends...as are art galleries, museums, and even this efficiency by the side of the road meets muster for rainy day activity (well stocked with DVDs, give-a-book / take-a-book library, elliptical treadmill and satellite TV). I've learned that just about every FBO can get you a rental vehicle or loan you a crew car to get into town. And where there are no spare vehicles I've been chauffered by line crew and even an FBO manager or two. Airport folk (and hotel folk, too) are great about recommending a good spot for chow and negotiating preferred hotel rates for the night. There have even been a stop or two where people have taken us into their homes, feeding us and providing us respite from the storm. That's inspired me to return the favor more than once. It is all part of a sort of pay-it-forward attitude in aviation that never ceases to amaze and inspire me. By creating our trips with routing over many possible stop off points, and by building time-padding into each long leg; and by knowing ahead of time that we'll find good folk to help us along the way, we can rest easy as the storms pass over us. To me there is nothing so soothing as watching weather I'd rather not fly in from the ground. It is infinitely better than experiencing that heart-wrenching moment where your realize you'd rather be on the ground than in the air; trust me. And when the storm clears? Expect glorious skies and some sweet performance out of your light bird from this spot to the next. I've managed to hopscotch from the Atlantic to the Pacific oceans and back again without missing a date or a deadline using this kind of long distance flight planning. The best benefit of all from our flight plans? If the winds and weather always blow in your favor you are left with extra vacation days at some of your favorite spots. And who is ever not in favor of a little more fun? airfests and fly-in adventures all over the world. Out of date though my copy may be, it is still relevant, and when I'm looking for an excuse to go flying it is perfect. I cross-check the information in the book with more recent data found on the Internet and more times then not I can find the perfect excuse to pull my airplane out of the hangar, fuel up, preflight and be off. Flying in to an event can be an experience all on its own. It's one worth preparing for, too. Don't discount information from friends who have been there! Some of my most fun fly-in experiences, from seafood fests in the Everglades to glider competition weekends, to an all-women's backcountry fly-in educational weekend were tips from good friends who were in the know. And those good friends who have been there are also knowledgeable about how those arrival/departure/parking procedures work in real world conditions, such as a misty marginal visibility morning arrival, or departures scrambling rapid-fire in the moments after the last performer lands and the first crack of summer lightning and thunder strikes. I remember with an eerie clarity the opportunity I had to be a backseat passenger in a French Robin (think of it as a Grumman Traveler), one of four, who flew in formation into Paris' Le Bourget airport, where Lindbergh landed nearly a century ago. We waited with impatience half the morning in front of a roaring fire at the tiny FBO in the countryside for the Paris skyline to clear of low cloud before we could takeoff. Once airborne the whole of the city of lights spread below us; the Seine a jeweled belt winding through its middle, sparkling in the sudden sunshine of mid-morning. We were vectored onto downwind and glided deftly over the gritty industrial buildings and apartments that now surround Le Bourget. Scenery? Nothing to write home about right around the airport. But getting to land where Charles Lindbergh landed? Where the Paris Air Show is held every other year? Even from the backseat it doesn't get any better than that. 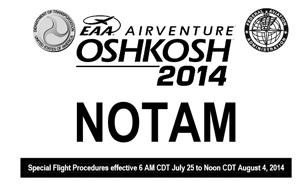 preparations to go even to the smallest of fly-ins, please, check the NOTAM for your destination airport. 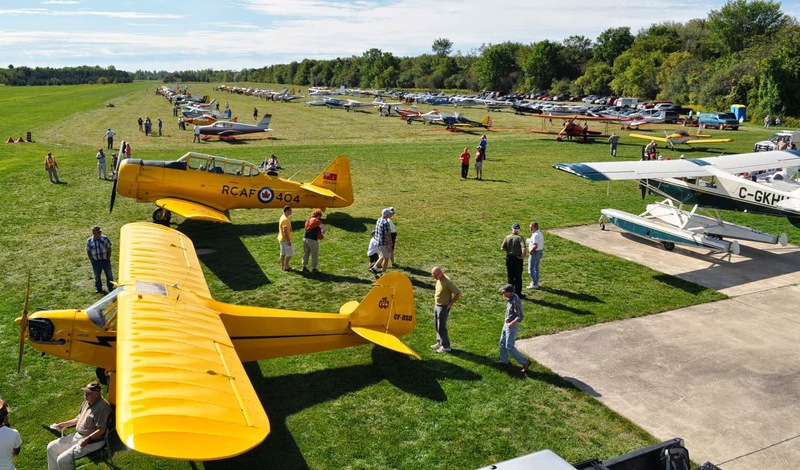 Even if the fly-in is small, check web information and, if you find nothing there, call the principal listed for the event. They all have a plan for how to get the bulk of traffic safely in and out of their airfield. You need to know that plan before you takeoff. Why? Fly-ins are notorious for bringing aircraft much closer together than what is normally encountered in a traffic pattern. Most of us are accustomed to seeing a couple of airplanes in the airport traffic pattern, but at a fly-in of any size you are more likely to encounter as many as a dozen aircraft converging on one point in space (say, the entry waypoint on the arrival procedure). Some will be eye-popping close! Be ready. Bring an observer to help you spot and avoid traffic. And study your arrival procedure carefully before your flight, so that you can focus on flying the airplane. Finally, spot landings are often necessary when airfields are crowded with incoming airplanes. Practice a few before you venture out, so that you can be flexible and capable of helping ATC get all those aircraft safely on the ground. Am I making you itch for an excuse to go flying? Autumn can be the best season of all for flying in much of the country with events such as Triple Tree and Petit Jean affording you wonderful venues for cross country flying. If you don't have Purner's book, you can still find great ideas for fly-ins on the internet. Browse to Socialflight.com, Funplacestofly.com and Flyins.com. Don't discount your AOPA or EAA calendar, either. They are also loaded with national and sometimes international fly-in treasures. You'll want to check next via direct email or telephone call to confirm the dates and get detailed information on each event. Then practice your pattern skills, study your NOTAM or arrival procedures, and go fly! 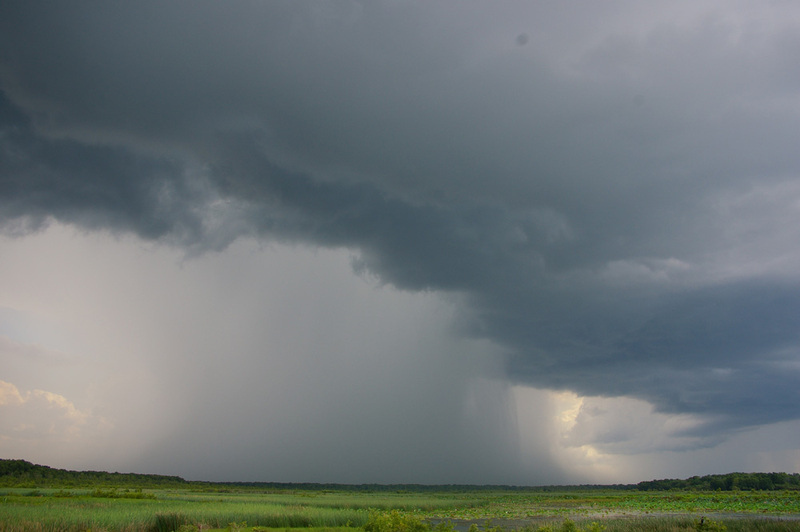 Rain, wind, cool breeze on my cheek...nice stuff to break the heat of what is often summer's toughest month, August. Nice stuff if you are sitting, as I am, in a cozy chair, near a cozy stove, in a simple respite by the side of a country road, not far from a little country strip where my airplane sits tied down tight against the gale. made it out to the airport, but deferred to better judgement and decided that, adequate ceiling or not, it was no day for flying in the mountains. Anytime the wind blows better than 20 knots at altitude and there are mountains involved light aircraft pilots had best beware. Turbulence known to damage much larger birds can be kicked up by the friction of the wind against the rocks rising to meet it. Though many think that only the Sierras or the Rockies are capable of churning up enough turbulence to damage a light aircraft, they'd best think again. New England's weathered ranges are equally capable of putting a hurt on an airplane. Some of the wildest wind and weather on record have been recorded atop Mount Washington, in Vermont. I'm sitting in the shadow of Sugarbush peak, in the Green Mountains, and I know the air gets squeezed and contorted as it whistles over this peak. Just two days ago I was soaring in a Schleicher ASK-21 directly over it, working to stay in the rising air kicked off by a bald near the top. Thermaling is fun if you enjoy steep turns and a good challenge. The trick is to feel the lift (seriously, this is a seat-of-your-pants kind of flying) and work to keep the glider balanced, turning, coordinated, right in the rising bubble of air. It is a bit like balancing on a beach ball whilst pivoting. Ever ride a unicycle? Maybe a little bit like that, too. Look up as well as out. If you see a bird or a glider above you, well, that's a good thing. Keep working and you might get to cloud base, too. Once there, push the nose over, pick up best lift-to-drag (L:D) speed, and cruise to the next potential bubble of rising air. Sometimes ridges throw up beautiful streets of towering cumulous clouds that provide a glider with continuous, sequential columns of rising air. A good pilot can harness that energy and fly straight along the street, pushing the nose over and cruising rapidly through the sinking air, and pulling the nose up to maximize time in the rising air. Get good at it and you can fly cross countries from a single quick tow to the first thermal. Of course, your mileage may vary. I've yet to build enough confidence in my soaring skill to head off away from the airport. I've been tempted a couple of times, but as a renter, I've always had limited time for my glider, and a deep fear of wandering too far from the home field. Most of all I worry that I might run out of lift. In my case I just don't trust my skill at finding and staying in the lift long enough to achieve adequate altitude for my cross country—yet. Of course, the -21 has a 40:1 glide ratio, quite a lot better than the gliders I've flown before. I may be underestimating it, and me. Call me conservative if you must. More than that, though I know I can get the glider down into a short, even a relatively rough field without doing damage, and though I know many potential landing sites along my potential routes of flight, I still want to avoid having to make the call back to the FBO to request a driver bring me the glider trailer, and all of the challenges disassembling and porting the ship out of said landing site and back to the airport. It is time-consuming for all, and potentially expensive for me. So why risk it, I think. One of these days, soon, I hope, I'll be able to stay at a good soaring site long enough to gain the confidence I require to make that cross country flight in a glider. Maybe not this year, I think, glancing at the rain pelting the glass, but soon. I just need to find a summer long enough to handle that wish. This kind of flying (see left) is not that hard to do. As a novice Part 135 charter pilot I used to do it a lot. And yes, air traffic control would hold me high, and then dump me in on final, and ask me to keep my speed up, even though I was in a single engine retractable gear airplane that had to be slowed in order to extend the landing gear. It had a turbocharged (not intercooled) engine that had to be babied and I had a boss who was not keen on novice charter pilots blowing up his engines. So, a good challenge that I rose to conquer. I never hurt an airplane or a person on this approach. I think someone taught me well. That is more than I can say for the crew of Asiana 214. Yes, the Boeing 777 is infinitely more complicated to operate than the aircraft I was flying "back in the day," but come on, that crew had weeks of training, and three pilots, two of whom were quite senior, in the cockpit that day. So, given all that, watch the simulation the NTSB put together of what happened, and tell me what you see. I see an unstable approach. I see the observer pilot doing his job and pointing problems out to the co-captains (a captain and a check airman) and I see the two senior pilots ignoring the observant youngster, who is too subservient to get in their faces about the fact that the approach is going to hell. Though I'll acknowledge that the intricacies of the Boeing 777's autopilot and autothrottle system contain more than one subtle "gotchas" for pilots, I believe it is the duty of anyone with enough chutzpah to captain one of these beasts that he or she work the problem until the systems are mastered. Period. At that level in our industry, it is not an issue of compensation. It is an issue of responsibility. And if you don't want that much responsibility, go back to flying Cessna Caravans full of freight. Sadly, more critical than all the subtleties of the 777 autopilot and autothrottle systems, these pilots (other than the kid on the observer seat) could not fly a visual glideslope, nor monitor and correct airspeed deviations that day. I don't solo a student pilot until he or she shows me they have mastered those basic skills with consistency. Hopefully, Asiana Airlines has learned that they can't put pilots in command who cannot consistently demonstrate those skills, either. Some things in life are decidedly not like riding a bicycle. Flying via instruments in a light aircraft is definitely one of those skills that does not endure. In fact, we call the IFR scan a "perishable" commodity. If you don't practice it with some regularity it will rot on the vine. With that definite knowledge, honed over more than 30 years as an instrument-rated pilot, I went out with my flight instructor in the RV-10 for a practice session (and a nice breakfast at KSEF) this morning. The weather was fine, the worst of it being five miles and mist, with light winds and essentially no cloud cover we fired up and taxied out for my first practice IFR in about two months. I felt it. The good news was that my checklist did not fail me. I managed to get both GPS programmed and the iPad set up for the RNAV GPS 5 approach at KOBE without problems. Yes, having a digital autopilot that I can trust and a feel for the airplane's natural speeds / attitudes helped. All was fine until I was given a hold. I hit the "sequence suspend" button (ours is a '90s era IFR GPS) and my flightpath disappeared from the moving map on my MFD. Crap. I'd forgotten to copy the number 1 GPS flightplan into the number 2 GPS and switch over before hitting "sequence suspend." A little incompatibility between the '90s era GPS and the 2006 MFD cause this glitch, and I know about it. I just forgot the work around. No big deal. I still had several moving maps, including the iPad, to enhance my situational awareness. I flew the holding pattern without fault and re-intercepted the final approach course, unsuspended the sequence by hitting the button again, and completed the approach. deal, since I have to fly the vertical on any approach manually. I'm always part of the approach in this airplane, and that helps facilitate transition from what I'd call semi-automatic pilot flying to human pilot flying. The landing was a full stop, and breakfast gave us time for debrief. I'd done okay. Slow to each segment, but not so behind that it destroyed the safety and smoothness of the flight. I was on altitude, on heading just in time. Not a second too soon, but just in time. I know with a little more practice it would feel natural again. The last segment wasn't straight home, and wasn't with autopilot at all. I'd call it full-engagement practice. 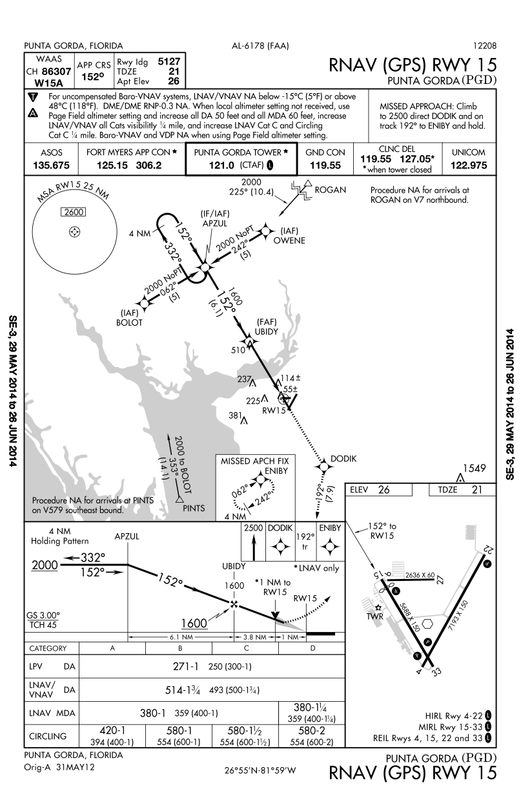 There's a lot to controlling an airplane that moves through the air at 170 knots, climbing a quick 700 fpm at cruise climb, all while setting up for another approach in just 25 miles. It is easy to look away and find yourself 10 or more degrees off course in seconds. Altitude control is essential, and that means getting and keeping the power under control in this beast. We were home just a few minutes later. The tally? 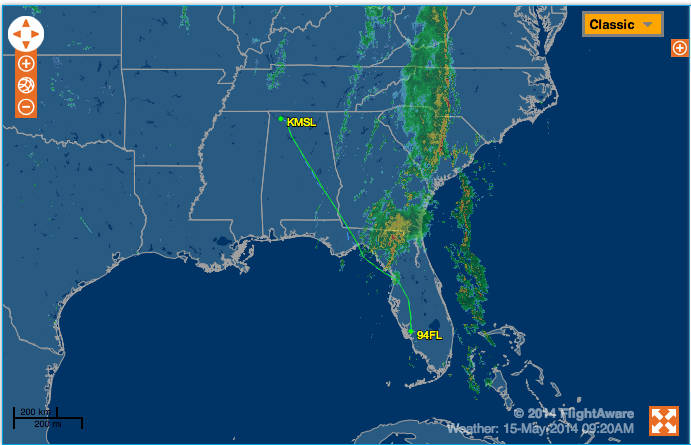 Three approaches, three airports. Leg one: 60 nm. Leg two: 30 nm. Leg three: 25 plus 9 nm. Total fuel burned over 1.3 hours and three climb outs: 16.5 gallons. I love this airplane. Yesterday was all about travel around here. I was confined to the back of two MD90s halfway across the country on what turned out to be a challenging weather day (not, apparently, as bad as others had dealt with earlier in the week, thank goodness!). My mechanic husband, on the other hand, made a 600 mile run northwest to do a pre-buy on a lovely Cessna 182 for some old friends. The guys left in the RV-10 early, and skirted the worst of the weather. That didn't mean they weren't in the soup at 10,000 feet. And then the iPad began to act up. It runs WingXPro 7, most current version, and it dropped the GPS signal completely. Who knows why? It wasn't a big problem, as the aircraft has two panel mounted GPS that worked fine. Next the Nexrad signal painting on the MFD appeared to get confused. 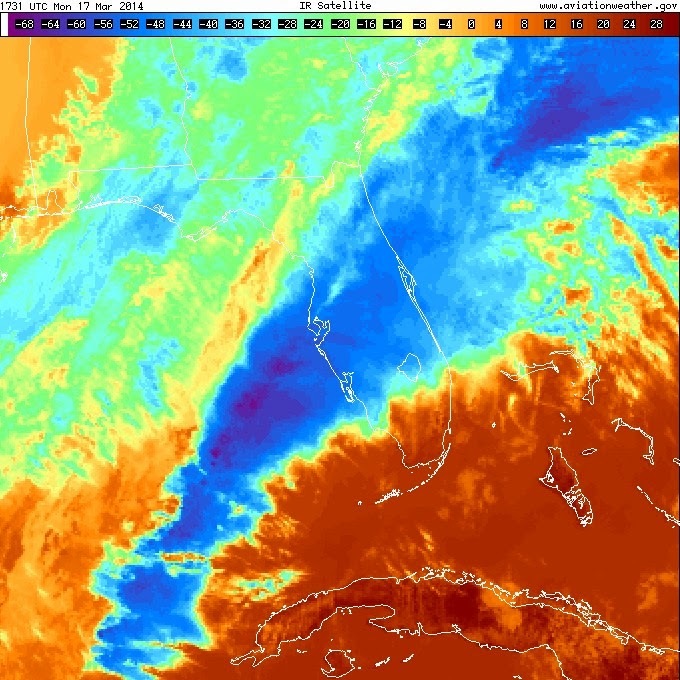 It showed the weather moving off to the east, and then on the next paint, showed the weather back right in front of them. Not comforting at all when you are in actual IFR attempting to circumnavigate the worst of it. They got kicked around a bit, but no harm was done. It was, however, one of the first times that ADS-B has let us down. Note to self: remember, it is only a digital signal, and delayed, at that. you" machine. Turns out it had a Stormscope (not noted on the Trade-A-Plane ad) and a better autopilot than they'd thought. It also had cosmetic hail damage. Ouch. Fortunately, beauty is in the eye of the beholder. With a strong engine and good paint and interior, plus a WAAS GPS navigator, this bird was a good deal for the new owner. This morning the RV-10 landed back home before noon, having had a quick ride with a decent push behind the cold front. The Cessna enjoyed the push, too. Flightaware pegged it at a blistering 155 knots as it tracked direct on its way here. Not bad for a 38 year old piece of hardware. She's safe and sound in her temporary hangar (still a little bit of tweaking to be done, and a short list of squawks to go through). Her new owner? He made like Superman, swapping civi's for his airline uniform in the hangar, and hightailed it out to make his commute to work. Ah, the life! The dominant colors of the day? Blue and green. Cerulean blue is the sky, nearly cloudless now as the sea breeze this afternoon has pushed what little moisture there is inland toward the lake. Verdant green is the spring foliage, growing as fast as it can before the earth dries out. We've had no rain for nearly a week. Is this the beginning of fire season? I wonder. The hangar has been buzzing with action, as everyone brings their airplanes in at once. It seems like every pilot in the neighborhood wants his/her airplane inspected before their big summer trips. Or it could be that the weather has finally stabilized to the point where they want to fly again and are discovering the horrible truth: airplanes that sit tend to have more unairworthy items. Stinks, but airplanes aren't happy if they aren't flying. jam of airplanes in the hangar. But this weekend? I'm feeling as if I'm just going to have to go fly. Destination won't be important. It will be the exercise of preflight, climbing in, running the checklist, firing up, taxiing out, running up, and then clearing the area for takeoff. That's what counts. Once airborne I'll head west to the coastline, and run my typical patrol. It's a stunning sunrise or sunset tour, and not too bad even in the in-between hours. Twenty minutes is all I need. Strange, isn't it? Twenty minutes in a perky little yellow machine at 1,000 AGL and my whole attitude resets. It's been like that with me for 35 years now. Let me alone at the controls of an aircraft in flight for a little while and I'm a new person, in a new world. When people ask me, why do I fly? I tell them: that's why. March comes in like a lion in other places, but this year it was a lamb, at least until now. Usually March means big pressure differences between Lows and Highs and tight isogonic lines delineating such pressure differentials on the weather charts. And all that means big wind. Last night, after days of balmy spring weather, I dreamed a wind storm. Woke at 3 a.m. to the sound of a stiff breeze making the slash pine moan and the saw palmetto rustle. The night air had turned humid with the southwesterly flow and smelled of the jasmine bushes just outside my window. No clouds to stop the nearly full moon from lighting the place up like dusk, but I swear you could feel the barometer dropping with each gust. Throughout this morning and into the afternoon as I work here in my office on a totally unrelated story I am completely distracted by the sound of the wind working itself into a full gale right on the other side of the glass. It's hurricane glass, so I've nothing to fear. Even if the gale sent a chunk of pine forest flying into the panes they'd hold together (shatter, sure, but the membranes between the double panes would keep it all intact). "Good to keep out even 2X4's at 150mph!" said the salesman who talked us into protecting the house and ourselves this way. I've never had to test them, even through two hurricanes. Hope it stays that way. bias and slam into us with its full force of near hurricane force winds, lightning and, thank goodness rain (this kind of weather's only redeeming quality). We do need the rain to keep our fire season at bay just a little longer. We'll tolerate the hammering for a couple of hours to get to the cooler, dryer breezes behind the frontal boundary, and enjoy a breath or two of springtime before the tropical summer claws its way northward, helped along by the blocking action of the Bermuda High, due to shift into place sometime next month. When that happens, hibernation begins. The world ceases to be civilized (okay maybe just in temperature and humidity) between the hours of 10 and 5. The air conditioner kicks on and stays on, and for us worker bees, vitamin D tablets are a good thing. Summer in south Florida. I'm not looking forward to it. If there is one thing I've learned over my 30 years as a published writer it is that not everyone is going to love what you write. In fact, a healthy number of people are probably going to disagree with just about anything you put out there. Look, even weathermen have this problem, and all they have to do is translate a METAR into whatever language they are communicating in that day. A writer who wants others to read what she has written cannot win. My advice? Get over it. So much more easily written than said! Yes, even I can get annoyed by reader comments from time to time. 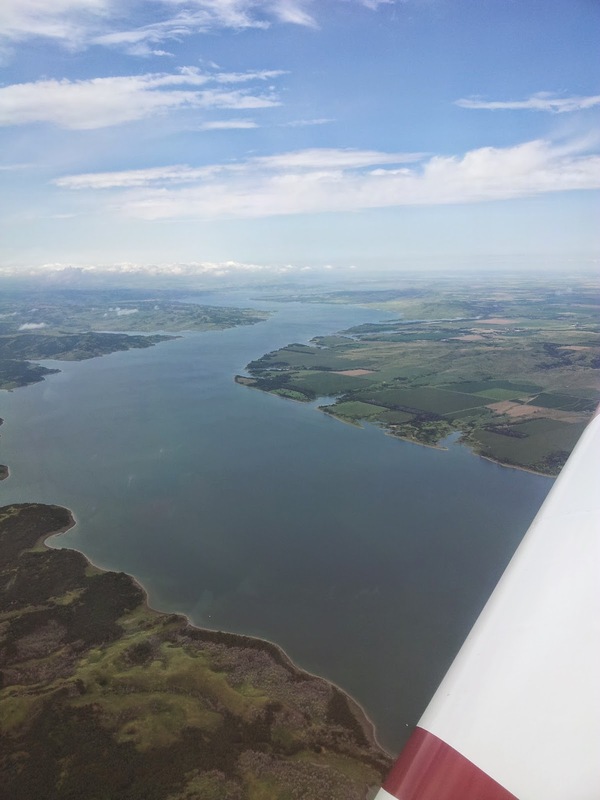 Most recently I wrote a blog piece for an alphabet-soup aviation group that was really just a reflection on the new year, and my aspirations for flying in it. Simple. Pretty. Chock-full of suggestions on where to go with your airplane. I was clear about where I live and fly: south Florida. Winter is our favorite flying season here because the weather is as perfect as it gets, and predictable, too. Commentary included pithy reminders that half the country is covered in ice and snow and, given the general conditions under which ice and snow occur, why would anyone want to go fly in a light aircraft? Well, that may be true for that commenter—but I wish he'd had a little more whimsy. Heck, I wish he'd just considered that some of the most beautiful flying one can do is on a crystal clear, ice-cold still-wind day. (I know; I've done it.) The sky doesn't get any bluer than when it contrasts with a prairie of pure white snow, perhaps pocked by cottonwoods, pine and spindly aspen or birch, or even framed by colossal granite mountains. The good news about this particular blog is that it is read by a huge faction of aviators, and before I could even argue with myself over whether to respond to the commenter another commenter came to my defense, noting that the other half of the country was basking in the best possible flying weather, from California to South Carolina and destinations south all was CAVU on that particular morning—a typical winter flying day for 95% of those locales. My point precisely. Good to know at least one reader agreed. One thing about me, wherever I go, whatever I do, if I haven't seen the place, experienced the country from the cockpit of a light aircraft, well, then, I haven't really been there. That's just me. So wherever I travel, if I can't fly there in my own aircraft, I work hard to uncover opportunities to at least ride shotgun with another pilot and capture that bird's eye view of the world from on high (but not too high up--that would be like an airliner!). Why this compulsion? I've been flying in light aircraft since before I could read, and piloting them more than half my life now. I dream of being airborne, floating on air currents the way I flew through lava pinnacles and chutes when scuba diving in the Pacific. I see the ground rushing past me as when I've skydived. And clouds—anyone who has flown the gauntlet of towering cumulous midday in Florida en route to home before they overdevelop into dreaded cumulonimbus knows the thrill. Climbing and sinking to get around a craggy outcropping, weaving a path while always straining for ground contact, the heat-soaked, limp, languid, humidity of the afternoon left ever so far below you. I love it. it on a map—use Google Earth) was a pilot's paradise, with rare motorcycles tucked in behind the beautiful blue and white RV-10's wings. A classy bar was tucked into a corner for after-flying libations, too. We pushed the airplane out into the warm afternoon light and clambered up into our seats. The bright MGL dual screen system came to life and Marc cranked the Lycoming up front. We were off shortly thereafter, heading toward Robben Island, where Nelson Mandela and other political prisoners were held in the apartheid years. From there we turned east, and headed toward Table Mountain, which defines the geography of Cape Town. 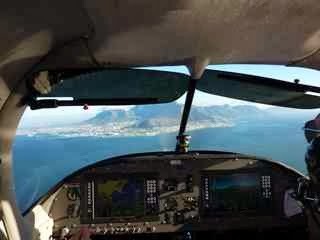 We skirted the massive mount, weaving our way out toward its point, then around past Simon's Town, Muizenberg and down the beach low, at the request of ATC, dropping under the traffic landing at the international airport. From there we zoomed up and over the Kogelberg Nature Reserve, dropping down again off the cliffs at Hermanus, where a mother humpback whale and her calf surfaced as we circled, watching us as intently as we watched them. We broke off after a couple of circuits, not wanting to disturb them much, and with the sun sinking on the horizon anyhow. Zooming back over the cliffs at Hermanus I looked off to see the ever pervasive tendrils of fog stretching from the cap cloud on Table mountain, rushing toward the beaches as the air cooled in the late afternoon. Sure, I'd driven this entire route in the weeks before this flight, but in just one hour aloft I'd finally seen it—I mean really seen it—and began to understand the diversity and complexity of such an amazing, blessed, cursed, blessed country. That flight made me want to understand it better, know it's people, be a part of it's survival. You don't get that from your seat in row 27. Not even if it's a window seat. Not to steal from the Sound of Music or anything but, today, this post, heck, this blog is all about where I am going next. At 50-something this pilot, writer, mom, wife, well, yeah, you name it is stepping, well, not exactly off a cliff and into the blue (nice image--but frankly starting a blog isn't that big of a deal), but definitely heading out on a new trajectory. So, interested? Stay tuned as I begin the journey. It's a beautiful January afternoon in South Florida, the sky a perfect cerulean blue, the breeze popping just enough to make flying my taildragger interesting. It's an experimental Kitfox IV that's been my "fun and functional" airplane for more than 21 years and we've just resuscitated another cylinder on the more than 10-year-old Jabiru 80 hp engine. This trip was 45 minutes into the wind north to visit my web and internet media expert and good friend Jack Hodgson, of UCAP fame, and my trusty editor from Aviation Safety magazine Jeb Burnside. I must say I compensated for the recent mechanical fixes with a little more altitude, even though it cost me 10 knots of speed (fairly expensive in the Kitfox, which only goes 100 knots full-bore across the ground on a no-wind afternoon). Found the airport sans GPS from no more than 1500 AGL, so at least my pilotage and ded reckoning skills are still intact. Now we are in the thick of setting up a few good projects, so...stay tuned! P.S. Wondering about that background image? My buddies from Cape Town can tell you more about it. South Africa is one of the most beautiful and friendly places in the world for light aircraft flight. Amy Laboda has been flying airplanes since she was 15 years old. She's taught flight students from East Coast to West, and currently serves as a National FAA FAAST Team member, providing Aviation Safety Seminars for FAA certified pilots in the U.S. and abroad. She was the Editor in Chief of Aviation for Women magazine for nearly 13 years before returning to her freelance writing and multimedia career. She is currently a contributor to Kitplanes magazine, Aviation Safety magazine, Aviation for Women magazine and Aviation International News monthly, ainonline.com and AIN Show Dailies.